I need something large enough to fit a growing family, and occasionally to fit adults in the back. Safety and reliability are important, though I'd also like to find something that's relatively fun to drive, if possible. Nothing too big or high off the ground. Low profile is good. The more it feels like a car, the better. Most American cars that fit 6 or more look too big (though I haven't done enough research to say that as a rule--it's probably more of a prejudice at this point, and one I'd be happy to be disabused of). 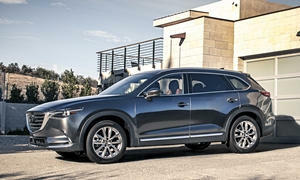 I've looked at the Mazda CX-9--it seems to check a lot of the boxes, but the gas mileage is slightly disappointing. And it's got less than ideal IIHS safety ratings, at least on some tests. I've also looked at the Mitsubishi Outlander, but there I have concerns about depreciation, materials/workmanship, and the "fun to drive" factor. 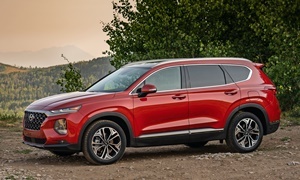 I'm aware of offerings from Hyundai (Santa Fe/Veracruz), Kia (Sorento), and Nissan (Rogue), though I'm not very familiar with them. Reports of first-hand, long-term experience with any of these (or others that I'm forgetting/unaware of) would be extremely helpful. Some cool or unique features would be nice--not necessary, but they would help. And it would also be nice to look out into the driveway and say, "yeah, that's a pretty sweet-looking car." These things are more like icing, I guess. Although, I would never buy a car that I thought was ugly. And I definitely do not want a car that "feels cheap," so to speak, if that makes sense. I suppose that's where the "materials & workmanship" comes in. My wife's one stipulation was: "No minivans!" Honda Pilots are 3-row, very reliable, and get good mpg for what they are. They're kind of vanilla, but well engineered. I'd say the Pilot and CX-9 stand out in the 6+ passenger SUV segment. You can check the data on this site, but the Mitsubishi, Hyundai, Kia, Nissan and domestic offerings in this segment won't generally have the same reliability as these two. And consequently, depreciation should be best for the Honda, almost as good for the CX-9. If the Pilot isn't snazzy enough for you, there is the Acura MDX which is similar but nicer. There aren't really good car-like 6+ passenger options. I believe you've got to go back to the Ford Taurus wagon from pre '06 for a 3,500 lb-ish 6+ passenger car. There's also the 05-07 Ford Freestyle which would be significantly below your price range, but is also more car-like (still 4,000 lbs). 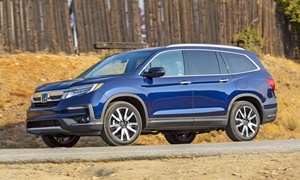 The subsequent wagon/crossover offerings with that many seats (Benz, BMW, Volvo XC90, Fords Taurus x, Flex; probably missing some here) are about as heavy as the Pilot (4500 lbs) and will cost you more per year to maintain and keep on the road than a comparably priced Pilot/CX-9. I'd convince your wife to get a minivan. Hear me out: they are roomy as all get-out (especially for huge car seats/child pods and folded strollers, easy to manuever and park, easy to access for kids, and durable. 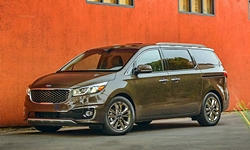 Honda Odyssey is always a great default choice, but that new Kia Sedonda is pretty sporty looking too. 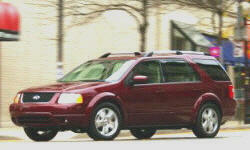 Regarding the "minivan" image - what greater badge will you ever wear than that of being a loving parent? Personally I see them as a badge of honor. My brother and his wife finally replaced their old, tired Dodge Caravan now that the kids are in HS and immediately regretted it...plenty of room fo rhte kids to stretch out, can handle friends riding along no sweat. 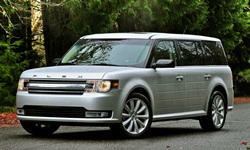 But if that didn't convince her...look closely at the Ford Flex or Ford Explorer, both based on a strong Volvo chassis. The Pilot is pretty good too, although it's about to be replaced. BUT GO WITH THE MINIVAN. 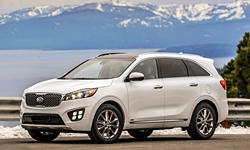 Among three-row crossovers, the 2013+ Hyundai Santa Fe has the lightest, most car-like feel. The Mazda CX-9 is also fairly sporty, but is larger, heavier, and less fuel-efficient. Thanks for all these replies--this is helpful. I hadn't really considered the Pilot--I'm not enamored of the big box aesthetic. Ford Freestyle is an intriguing idea, not least because it's well below my price range, although it's hard to find any with much less than 100K miles. Ford Flex I will take a closer look at--it's also strikingly rectangular, but in a more interesting way than the Pilot. I'm sure my wife and I are both unjustifiably prejudiced against minivans--I will take another look. 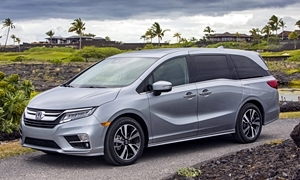 The 2015 Sedona does indeed look like the sportiest minivan on the outside--perhaps we could be convinced to go that route. However, a new one is above my price range, and previous years' Sedonas look very dated, especially inside, and significantly less sporty. Frankly the more research I do, the more I'm thinking the CX-9 is the car for me--in terms of price and reliability it seems to make the most sense. The only real hangup I have is the gas mileage. The Santa Fe would give me a little boost there and it sounds like it has the handling and car-like feel I'm looking for. But the price is a little higher. To get a significant upgrade in mileage though I'd be looking at the Nissan Rogue. (Outlander also gets good mileage, but I've all but eliminated it from contention for various other reasons.) What are the best reasons for/against getting any of these cars? 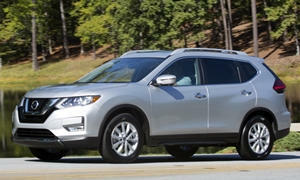 Is the new Rogue still likely to have CVT problems down the road? How does it compare with the CX-9/Santa Fe in terms of handling and sportiness? Should I be worried about the Santa Fe's/Veracruz's somewhat spotty reliability record (I realize the Santa Fe Sport is included in that record)? What other issues should I be considering? Thanks again. The Rogue isn't at all sporty, and it's too soon to pass judgment on the CVT. But it's a very pleasant vehicle--my review is listed in the "more about" beneath its photo. The big question, aside from sportiness, is how often and for what size people you need a third row. The Rogue is much smaller than the other suggested vehicles. 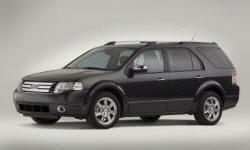 The Ford Freestyle was replaced by the 2008-2009 Taurus X, which also had a more powerful engine and a conventional transmission. We own a 2008. I like the interior layout, but am concerned about its reliability, and the driving position might be too high relative to the instrument panel (an unusual problem). The steering is numb and the suspenion doesn't control body motions well. Maybe I need new shocks at 70k miles? Fuel economy has been disappointing, 16-17 in the suburbs and 21 on the highway. Back in the pro's column, it does drive smaller than the Flex. Have you driven the CX-9 and the Santa Fe? I would plug in your potential purchases into the mustachecalc.com "vehicle cost per mile" calculator to get a sense of what your various options will cost you. That will help to account for some of the "better mpg" versus "worse reliability", etc apples and oranges inherent in the selection process. To get the estimated sale price, check kbb for the same (or similar) vehicle x years older with x years more miles on it. Use data from this site to help you figure out what your maintenance costs would be per year. 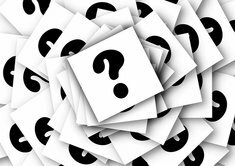 I can't really give you any better reliability data re: questions of CVT reliability, etc. than what is already on this site. How have the other (brand X) CVT's held up, etc. You'll probably find that the mpg doesn't make as big a difference in cost of ownership as you think; it's more driven by purchase price minus sale price. You'll probably just have to test drive to check sportiness for your top couple of choices; it is somewhat in the eye of the beholder. 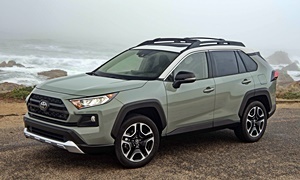 Just to complicate your choice further, there's also the Toyota Highlander (all 7-8 passenger) and Rav4 (some 7 passenger versions out there pre '13) which, while not know for their exceptional handling are very reliable with respectable mpg. I will probably not need to use the third-row seats even half the time, and when I do, I imagine it would hold kids far more often than adults. But occasionally adults would need to fit back there, which is one reason I eliminated the Outlander after actually looking inside it (that, plus how difficult it was to fold down the third row). Perhaps the Rogue should be eliminiated for the same reason. Indeed, I will need to test drive more of these to see what they actually feel like out on the road. I'll look at the Toyota offerings as well. My sense was that the Highlanders were outside my price range, and I didn't realize Rav4s came with seating for 7. I'll research these some more. Thanks for the link to that calculator--that should be helpful. It may well turn out I'm overly worried about MPG. 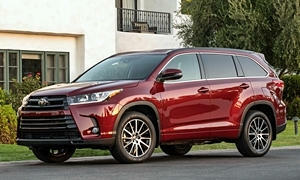 The third-row option was very rare in the RAV4. I don't think I ever saw one with it. It's no longer an option on the 2013+. Must be a nearly useless seat. It sounds like you need some good test drives in the CX-9 and Santa Fe, to see which you prefer. Well if it isn't too late (and that Honda Odyssey didn't 'hook' you), the Kia Sorento is a mid-size with a useable 3rd row. I'm impressed with their build-quality and drivetrain warranty. Kia (and Hyundai) have come a long, long way in the last 10-15 years.